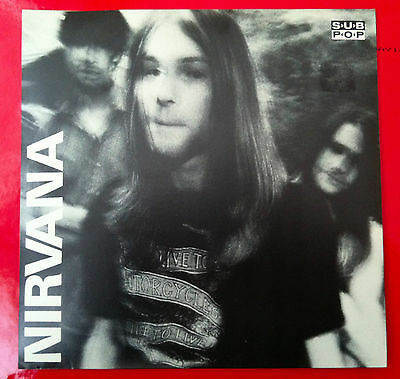 Original 1st Pressing of Nirvana's 1st single Love Buzz/Big Cheese. This is number #67/1000. Finding numbered editions under 100 is near impossible. I have never seen another real copy under for sale. It may have some extra sentimental value to you since Kurt was born in 1967. It did for me. I bought this record at Generation Records, NYC, in May of 1994. I guarantee it to be a 1st pressing/original or you can return it for a complete refund. Why don't you trade those guitars for shovels? Record looks unplayed. I think I played it once. Label is clean. It has some small white lines around record hole (see pictures). These are from the hole being punched after the label is applied during pressing. I have owned two other copies of this record and all have had these line. Please check out the pictures to see for yourself. Sleeve has some slight yellowing due to age. There is a 3/4 inch crease on the upper left corner (see picture) and one that is about and inch a slightly further to the center. I was unable to get this in a photo. It is more of bend/indentation most likely from the record. There is also price tag residue on the right side.